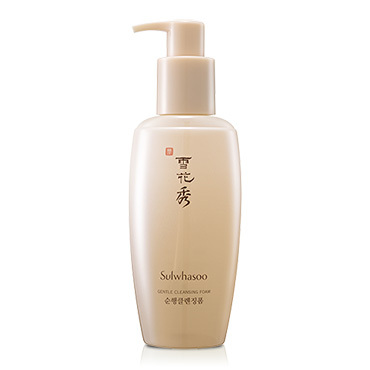 The Sulwhasoo Gentle Cleansing Foam is the 2nd step of the Sulwhasoo program. Ingredients include white birch and Korea fir tree extract. There is a bit of heat as I was using it to clean my face. This heat helps to increase blood circulation. A gel like cleansing form, add warm water and it will foam up. There's not a lot of form but its cleansing ability is quite good!! Since the texture is a gel, it doesn't dry up your skin and after cleansing, you will feel hydrated. In the morning, I only used the Sulwhasoo Gentle Cleansing Foam. In the evening, after using the Sulwhasoo Gentle Cleansing Oil to remove my make up, I will follow with this cleansing foam to make sure no impurities are trapped in my skin. Again, it does have a herbal scent, but not too strong, acceptable.